Running a business means keeping track of your employees. Not only to make sure they are doing their jobs, but if one of them happens to be sick you need a way to get a hold of the next available associate. A simple contact list is something every manager should have, and it should be easy to use so all managers can access it when necessary. The contact list template that we show here is simple and easy to use. You can simply print it out and use it the way it is, or type in all the information that you need and print later so you have a professional looking copy on hand. A contact list is a must have for any business. You will need to get a hold of your employees for any number of reasons. One of your employees could be hurt on the job and you will still need to run your business. Perhaps someone called in sick for their shift and you need another employee to replace them. You might need to contact another manager who worked the night before to ask them questions about their work. 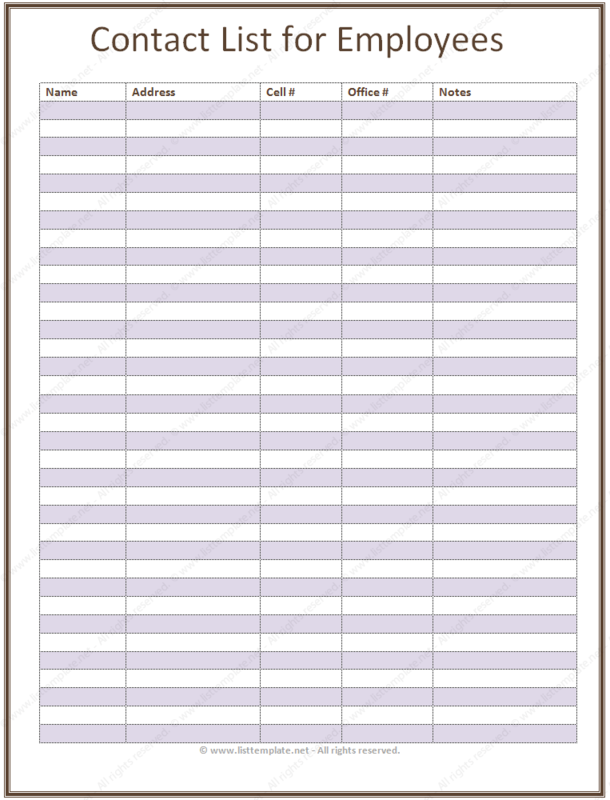 This contact list template is made in Microsoft Word® and enables you to put the employees name and phone number as well as address and any notes. There is even room to add a second phone number if the employee has one.